A comment on this Icom M506 article pointed out that most people only have one VHF on their boat, and hence the issue I discovered when using two of them has limited impact. He's right, but hold on a minute before you run out and buy an M506 with NMEA2000. I did just that for a small runabout that we recently got, and was in for another unpleasant surprise. We recently got a Grady White open boat and I picked and installed electronics for it. It's a very simple system - about as simple as you can get - a Furuno TZTouch2 multi function display plus an M506 VHF. As I've said before, I really like the M506 as a VHF, but find the optional NMEA 2000 interface to be pretty seriously broken. But in this super simple, bare bones config of a single MFD and a single VHF, I figured my chances were pretty good that it would all work. Wrong again. First off, the M506 continues to appear to the TZ2 as a valid data source for just about every imaginable type of data. Take a look at the screen shot below. Really? The M506 is a good source for rudder position, rate of turn, atmospheric pressure, outside temperature, etc? Come on. But it gets better. The TZTouch2, like many MFDs, has a built-in GPS. This is very convenient for an open boat where you can get an acceptable signal. The TZ2 and M506 both have N2K, so it's just a matter of connecting them together. The TZ2 provides GPS to the VHF, and the VHF provides DSC alerts back. But when I hooked everything up and powered it on, the M506 was complaining that there was no GPS data. How on earth can something so simple from two very reputable companies not work? The TZ2, once you enable a couple of things, puts out a couple of different GPS data messages (PGNs). 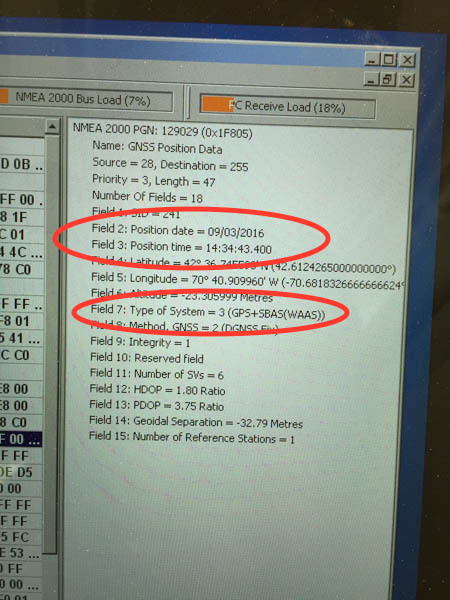 Both of them include the basic GPS position info, and one includes additional information that reports the general status of the GPS receiver. The TZTouch2 doesn't fill in that status info, but the M506 expects it, and rejects the message when the info is not there. Or at least that's how it appears. What I know for sure is that when I hooked up an external GPS, the M506 started working fine. And when I compared the messages being sent and their contents, the status info was the only difference. I sent traces to Furuno since this time is looked like the TZ2 was the culprit. They replied that this was a known issue and that they were working on it. To add to the confusion, there was an issue a while back between the TZTouch (not the TZ2) and the M506 where AIS data was not passing successfully between the two. I never experienced it myself, but it was widely reported. 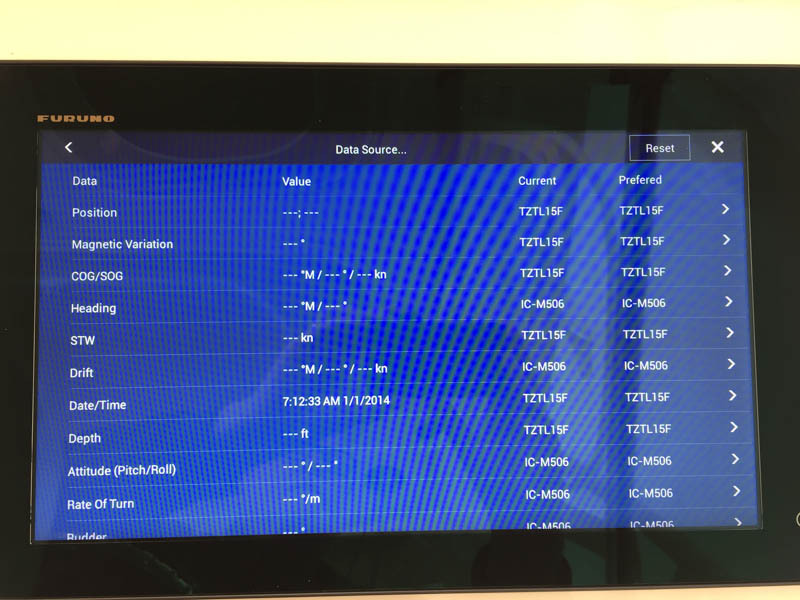 AIS data received by the M506 was not displaying on the TZTouch. This problem was fixed a while ago by some combination of software updates on the TZTouch and the M506. I'm not sure whether both devices need to be updated to fix the AIS problem, or if updating either of the two will solve it. Regardless, the issue I encountered is completely different, has nothing to do with AIS (my VHF doesn't even have AIS), and I'm running the latest software in both the M506 and the TZTouch2. 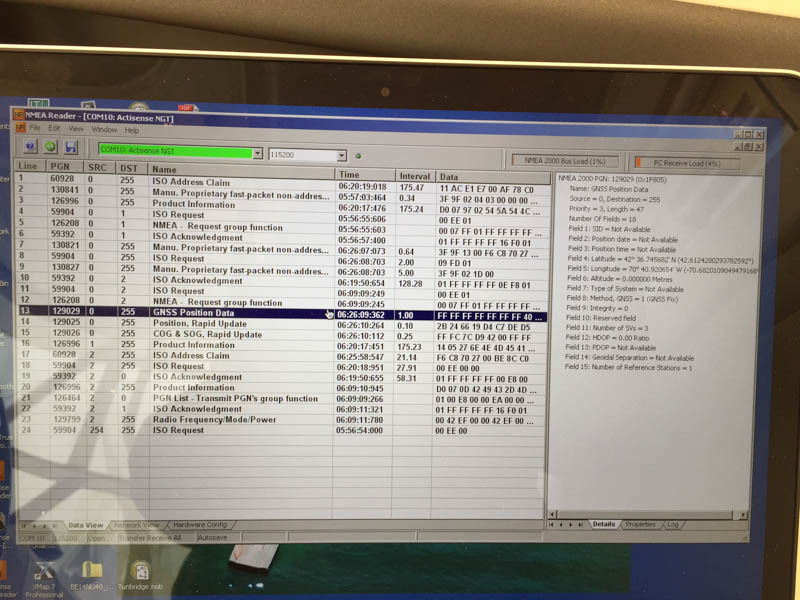 Below is a screen shots showing operation with just the TZ2 providing GPS data, and a closeup of the message contents. Then the same thing again with an external GPS. I've circled the missing data in the message from the TZ2 that appears to be the problem. Me again. Okay, if I read you right it seems like the fault in this interaction lies generally with the Furuno product and not the Icom one. 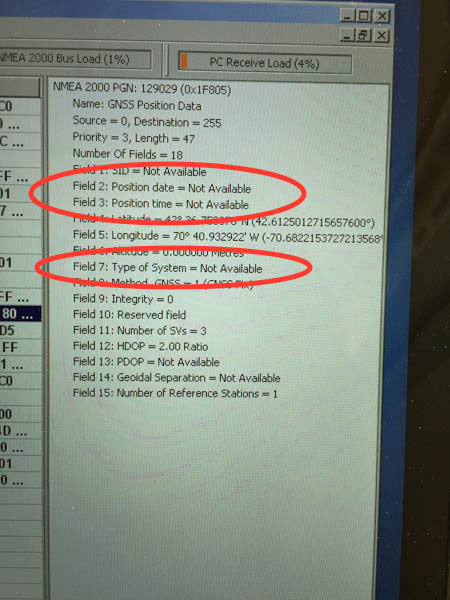 The Icom wants valid GPS status info, is that a bad thing? As for the TZ2 viewing the Icom as a valid source of all sorts of info it couldn't possibly provide, is that because the the Icom is too promiscuous or the Furuno to presumptive? Do the Icoms on Tanglewood mislead your MFD in the same way? 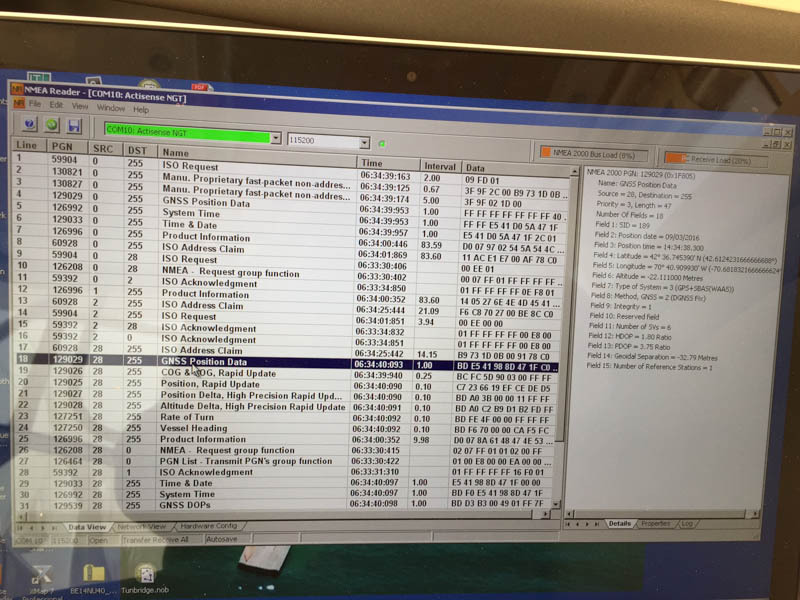 I'm not denying that you're seeing these problems, I'm just trying to assess the potential issues associated with putting a single M506 on my boat along with a Raymarine eS MFD, both on an N2K network. Yours is actually the first tale of woe regarding the M506 I've ever heard and the unit has been out for a couple of years now. My guess is that the M506's failure to see the GPS info is because Furuno is not forming the message correctly. But it's only a guess looking at what I can see from the outside. To confirm would require access to their code which I obviously don't have. Furuno has commended publicly that the M506 should be using the other GPS message that they send, but isn't. 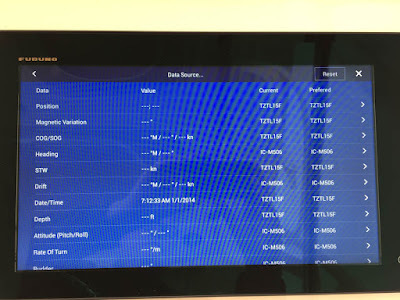 The spec and rules for NMEA 2000 are private and when you license them you agree to keep them private, so I don't know if Furuno is right or wrong. But looking at the contents of each of the two types of messages (which is publicly available), they both look equally good to me, so I can't see why a device should be able to use one or the other or both. As for the TZ2 thinking the M506 is a valid source for everything, I didn't diagnose that problem. But it's so similar to the issue I see with two M506s that I'd bet it's the same root problem. I'd bet the difference is that the TZ2 is sending out the same broadcast requests for various messages (PGNs) just as the M506 does, and the M506 is intern responding to them when it really shouldn't, thereby tricking the TZ2 into thinking it's a valid source. But that's just an educated guess. At this point I've put a ton of effort into diagnosing M506 problems, gathering traces, and sending them to Icom. But so far Icom hasn't done anything to resolve them, and keeps closing the cases that I open. 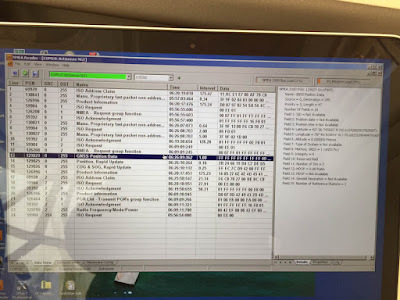 I can't say how it will behave with a Raymarine MFD, but my recommendation would be to forego N2K as the interface and connect up a Standard Horizon or Icom VHF via NMEA 0183. You can save yourself $100 on the Icom, and I think the SH VHF is even more cost effective and can still include AIS if you are looking for that. I really feel like a dope for buying a third one of the M506s when I knew it had problems. But I too figured the problems wouldn't show up with just one VHD, and MFD, and nothing else. Also, If you get an M506, you will probably have to get the FW updated right away. Mine didn't come with the latest FW. That means a trip back to Icom's service center for an update with 2 weeks turn around time, shipping, etc. Thanks for all your troubleshooting and advice. Will do, Peter. My big electronics refresh is planned for this winter and will involve a two Ray eS series MFDs, their new solid state RADAR, a new VHF of some kind, a Vesper AIS box, and an N2K backbone to bind them all. I've got numerous sailing instruments and an older Raymarine S3G autopilot that I'm going to try to get on the N2K network as well. Should be fun/hell. I preordered a ICOM 506 with AIS and N2k, and installed it the very same day I got it. So now I had the device in operation for two years and of course I had some issues... The first bug made all AIS targets point to north. Quite interesting to see some boats going 20 knots backwards... I find it difficult to understand how the bug could pass the quality assurance tests. However one year later that bug was fixed. But there is a second bug that I think is on ICOM's side. My Raymarine E140W it doesn't show all AIS targets, only some of them. Can be quite dangerous if you believe you have all targets on the MFD! I told ICOM support in Sweden about this issue when filing my bug report but it was not corrected in the following update. I did get all AIS targets displayed while testing on a Garmin MFD, but I still believe ICOM has I a problem to fix. I solved my situation by purchasing a Seapilot AIS transponder (works great). Possibly have ICOM solved this by now, but until ICOM can show that they solved this I consider there N2K implementation broken. 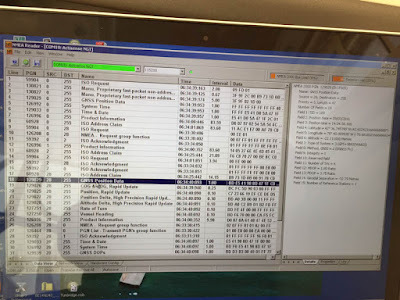 So this could still be an issue with newer Raymarine MFD's (response to anonymous).